In econometrics, you use the chi-squared distribution extensively. The chi-squared distribution is useful for comparing estimated variance values from a sample to those values based on theoretical assumptions. Therefore, it’s typically used to develop confidence intervals and hypothesis tests for population variance. First, however, you should familiarize yourself with the characteristics of a chi-squared distribution. The chi-squared distribution is a squared standard normal random variable, so it takes only nonnegative values and tends to be right-skewed. The extent of its skewness depends on the degrees of freedom or number of observations. The higher the degrees of freedom (more observations), the less skewed (more symmetrical) the chi-squared distribution. 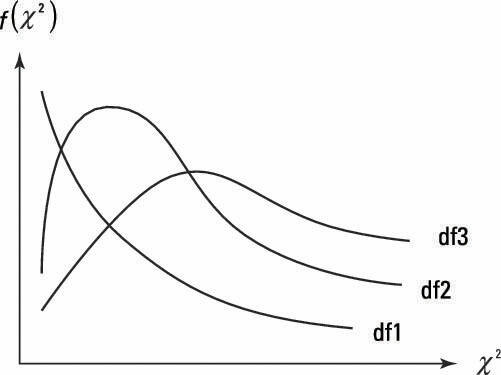 The figure shows a few chi-squared distributions, where df1, df2, and df3 indicate increasing degrees of freedom. The last step, in which you divide both sides by the known (or assumed) population variance, is what standardizes your sample variance to a common scale known as chi-squared.